A Texas teen and Galaxy S4 owner is making headlines after her device allegedly burst into flames while hooked up to a charger. 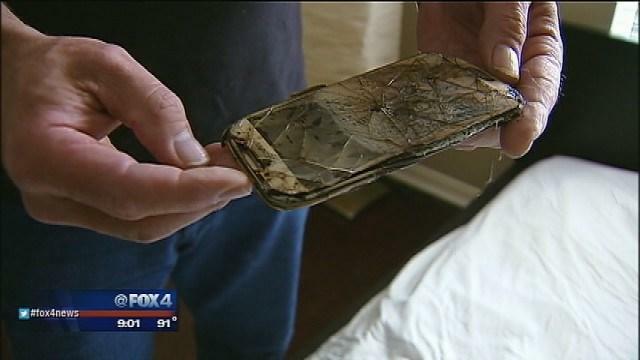 According to a Fox 4 news report, the girl woke up suddenly after realizing smoke was emanating from her pillow, only to find the phone itself was an unrecognizable mess. The picture above looks like someone turned on the grill, closed the lid, and forgot about it. The culprit seems to be a third-party battery—not surprised—and not the device itself. In the report, the teen says she let her phone charge overnight under her pillow, which seems to have created a recipe for disaster. The fact that the S4 was left under her pillow appears to have caused the device to reach dangerous temperatures; couple that with the faulty battery, and things obviously didn't end well. We've seen similar reports in the past, and they always seem to boil down to faulty third-party accessories. The fact that you can easily swap out the battery on your device is certainly nice, but when it's something cheaply made, there's potential for danger. Imagine if the teen wasn't home, and the device burned down the house? Let this be a lesson to other smartphone owners: err on the side of caution when purchasing third-party accessories. A case and screen protector is just fine. But when you start dealing with circuitry and internal components, you get what you pay for. Better just shell out the extra dough to ensure your phone doesn't spontaneously combust. Nobody wants to wake up to their pillow up in flames.